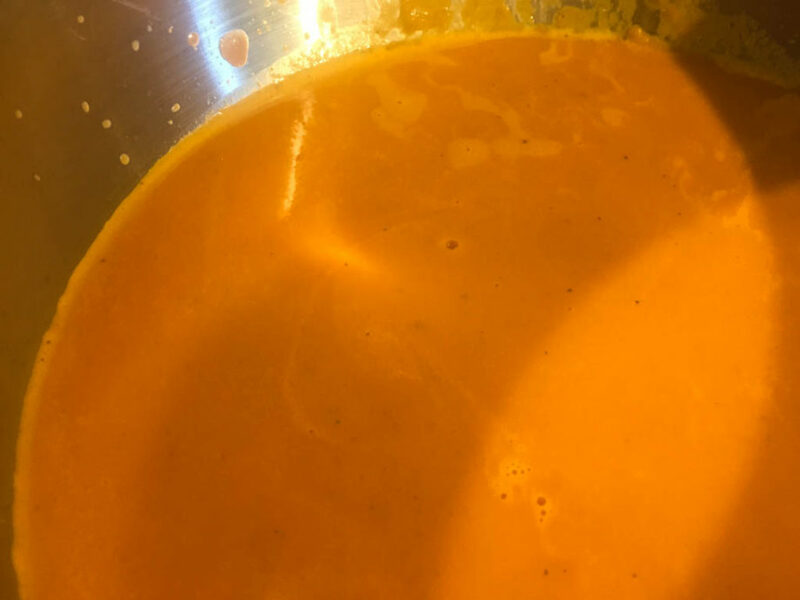 Home-made cream of tomato soup doesn’t look very much different to the stuff that comes out of a tin, but the flavours are worlds apart. I’ve made this a good few times, but not for a while now. I have some chicken stock left over from last week’s duck, so this seems like a good way to use that up. The recipe is insistent, quite rightly, on using very ripe tomatoes. Now, I’ve had Natoora’s Sicilian Datterini Vine Tomatoes a good few times, and they’ve always been delicious. They’d be just right for this, I’m sure. 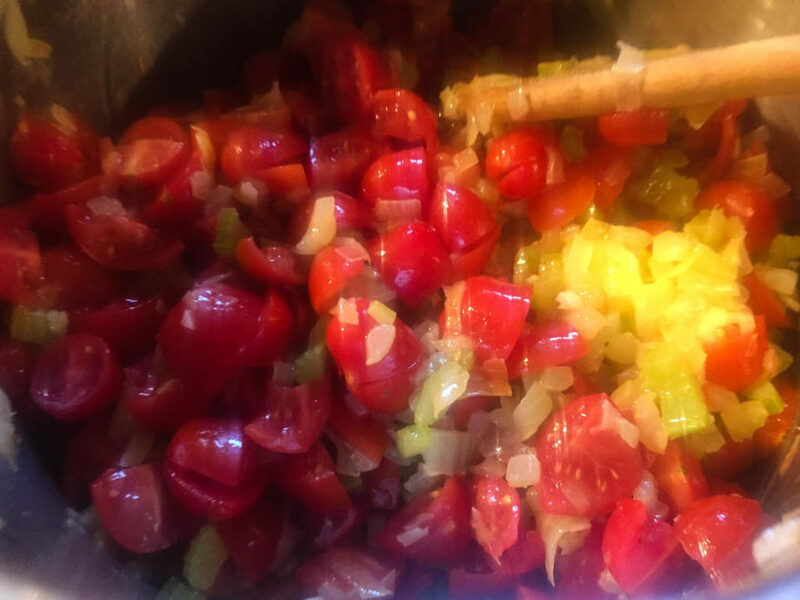 They do present a problem though – the recipe calls for the tomatoes to be skinned and chopped. These tomatoes are tiny – there must be dozens there – it would take hours to skin them all. I decide I’m not going to even attempt that. I just chop them. I soften some onion and celery with some butter in a pan, together with some garlic. Next, the tomatoes go in, together with a little sugar, salt and pepper. 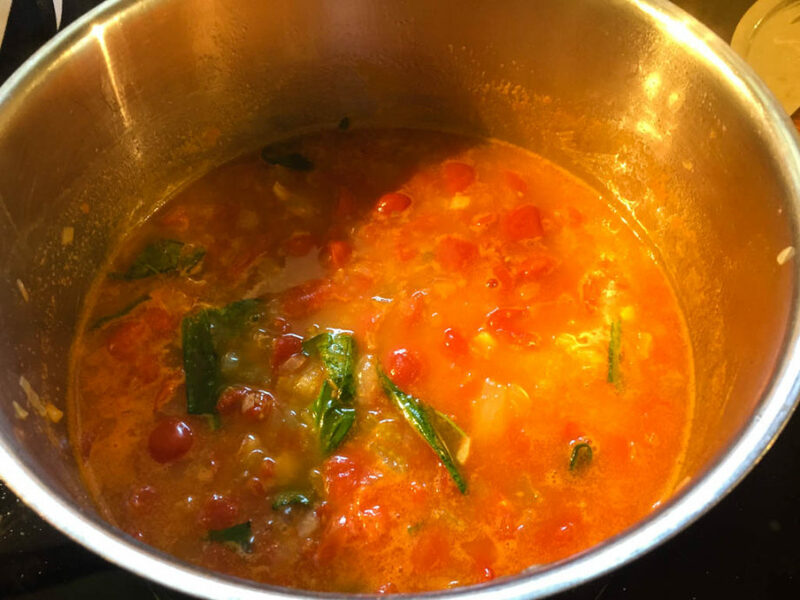 The tomatoes are cooked for a little while and then the chicken stock is added. To finish, some basil leaves and then I blend the soup with an immersion blender for a minute or two. Finally, the task I always hate. I the soup through a fine sieve. Once sieved, I return the soup to a clean pan, and add some cream. 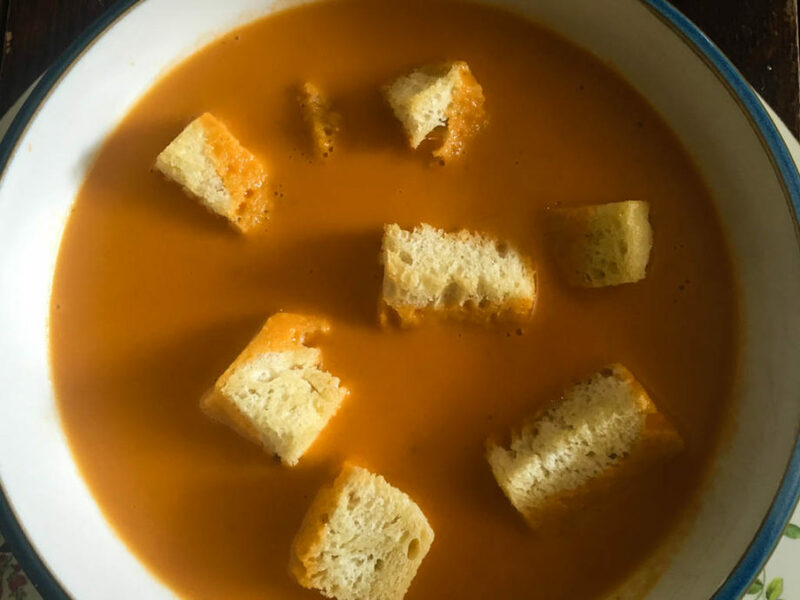 I warm the soup gently, check the seasoning and serve, with a pile of freshly made croutons. It is, of course, delicious. Beautifully creamy delicate tomato flavour. You can’t beat a good soup, and this is a good soup. The recipe says it serves four, but we can’t help but go back for seconds. The pan is empty when we finish. Probably my favourite of all soups, unless it’s chicken and tarragon. I love the flavour of good tomatoes. On the whole Britain doesn’t produce them. It’s probably possible with a greenhouse or poly tunnel to grow your own, but outside in the UK the weather is never good enough. I adore the tomatoes on Tenerife. So many varieties and so tasty. Anyway, I digress. 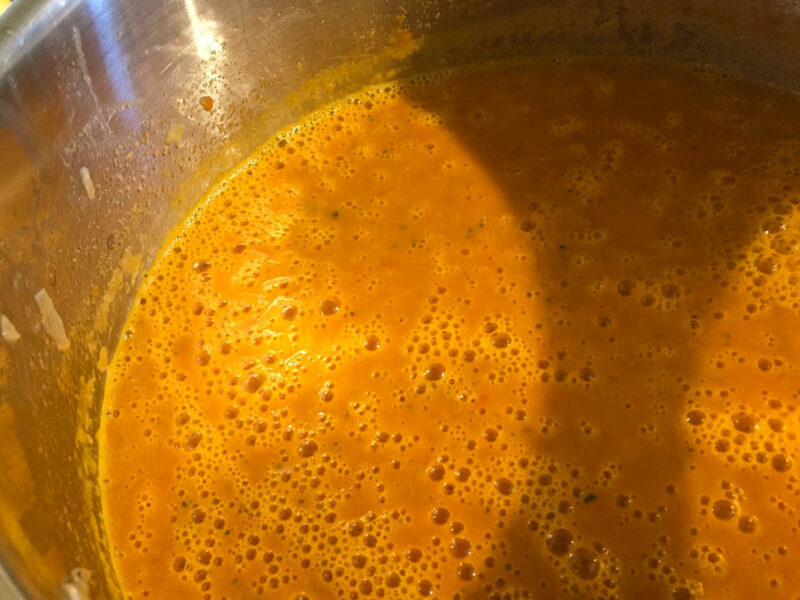 This soup was delicate, fragrant, beautifully balanced in the flavour department and a pretty pale red colour. And it was delicious. From first to last spoonful it tasted of elegance and comfort at the same time. The reason it was so delicious is that Dave bought in Italian grown tomatoes to make it with. None of the English watery, tasteless pap. Expensive, but worth it. I used to love Heinz tomato soup when I was younger, but now that just tastes like someone tipped a bag of sugar into one tin’s worth. And it’s too red and too thick. Dave’s version was a delight and could easily be served to guests. He served it with home made croutons, crisp and light with the flavour of olive oil. A really nice addition. I’m happy to have this soup anytime. 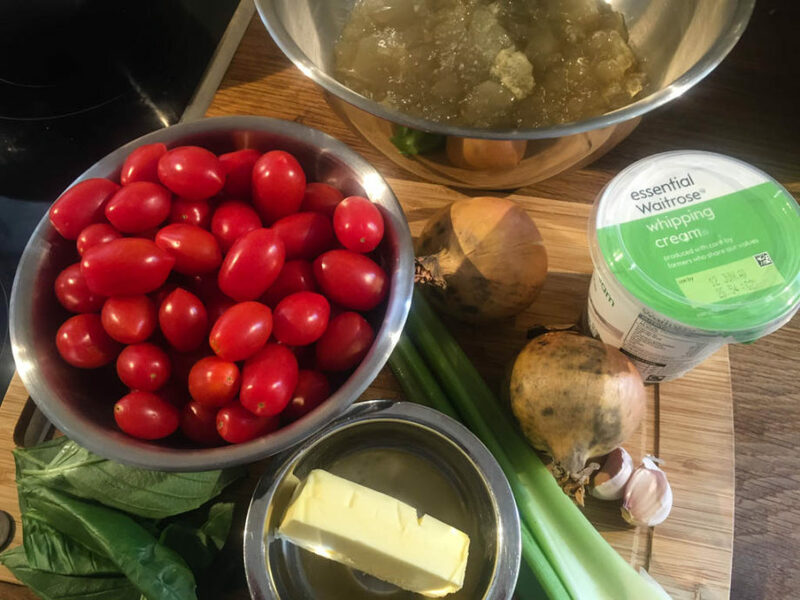 Excellent work, I tasted this soup and I would be happy to give it a score of 9 out of 10 points. Many thanks, Sir Samson Greene.